This protocol describes the methods in constructing a humanized bone-marrow/liver/thymus mouse model with stem cell-based engineered immunity against HIV infection. Zhen, A., Rezek, V., Youn, C., Rick, J., Lam, B., Chang, N., Zack, J., Kamata, M., Kitchen, S. Stem-cell Based Engineered Immunity Against HIV Infection in the Humanized Mouse Model. J. Vis. Exp. (113), e54048, doi:10.3791/54048 (2016). With the rapid development of stem cell-based gene therapies against HIV, there is pressing requirement for an animal model to study the hematopoietic differentiation and immune function of the genetically modified cells. The humanized Bone-marrow/Liver/Thymus (BLT) mouse model allows for full reconstitution of a human immune system in the periphery, which includes T cells, B cells, NK cells and monocytes. The human thymic implant also allows for thymic selection of T cells in autologous thymic tissue. In addition to the study of HIV infection, the model stands as a powerful tool to study differentiation, development and functionality of cells derived from hematopoietic stem cells (HSCs). Here we outline the construction of humanized non-obese diabetic (NOD)-severe combined immunodeficient (SCID)-common gamma chain knockout (cγ-/-)-Bone-marrow/Liver/Thymus (NSG-BLT) mice with HSCs transduced with CD4 chimeric antigen receptor (CD4CAR) lentivirus vector. We show that the CD4CAR HSCs can successfully differentiate into multiple lineages and have anti-HIV activity. The goal of the study is to demonstrate the use of NSG-BLT mouse model as an in vivo model for engineered immunity against HIV. It is worth noting that, because lentivirus and human tissue is used, experiments and surgeries should be performed in a Class II biosafety cabinet in a Biosafety Level 2 (BSL2) with special precautions (BSL2+) facility. Despite the success of combined anti-retroviral therapy, HIV infection is still a lifelong disease. The cellular immune response against HIV plays highly important role in controlling HIV replication. Recent advances in stem cell manipulation has allowed for the rapid development of gene therapy approaches for HIV treatment1-3. As a result, it is important to have a proper animal model that allows in vivo study of the efficacy of cell-based therapies against HIV. Working with HIV in animal models is complicated by the fact that the virus only infects human cells. To circumvent this limitation, scientists have resorted to using disease models like the Simian Immunodeficiency Virus (SIV) in Rhesus macaques4,5. Unfortunately, there are major limitations in this model due to the inherent differences across species and the differences between SIV and HIV. Additionally, only highly specialized facilities are capable of supporting work with non-human primates and each macaque requires a large investment. Thus, there is a pressing need for a model that utilizes the human immune system, which is susceptible to HIV infection/pathogenesis, and is less financially prohibitive. The non-obese diabetic (NOD)-severe combined immunodeficient (SCID)-common gamma chain knockout (cγ-/-) (or NSG) Blood/Liver/Thymus (BLT) humanized mouse model is increasingly proven to be an important tool to study HIV infection. By implanting hematopoietic stem cells (HSCs) and fetal thymus, the mice are able to develop and recapitulate a human immune system1-3. One type of stem cell based gene therapy involves 'redirecting' peripheral T cells to target HIV by reprogramming Hematopoietic Stem Cells (HSCs) to differentiate into antigen specific T cells. We have shown previously that engineering HSCs with a molecular cloned anti-HIV specific T cell receptor (TCR) against the SL9 epitope (amino acid 77-85; SLYNTVATL) of HIV-1 Gag can redirect stem cells into forming mature T cells that suppress HIV replication in the humanized NSG-BLT mouse model6. The caveat of using a molecular cloned TCR is that it is restricted to a specific human leukocyte antigen (HLA) subtype that will limit the application of this therapy. Chimeric antigen receptors (CAR), on the other hand, can be universally applied to all HLA subtypes. Initial studies were performed utilizing a CAR constructed with the extracellular and transmembrane domains of human CD4 fused to the intracellular ζ signaling domain of CD3 (termed the CD4ζCAR). CD4ζCAR expressed on CD8 T cells can recognize HIV envelope and trigger a cytotoxic T cell response that is similar to that mediated by a T cell receptor7. We have recently demonstrated that human HSCs can be modified with CD4ζCAR, which can then differentiate into multiple hematopoietic lineages, including functional T cells capable of suppressing HIV replication in the humanized mouse model8. With the rapid advancement in chimeric antigen receptor therapies for cancer9, and the ongoing characterization of potent broad neutralizing antibodies10-12 against HIV that allow the construction of single chain antibody CARs, it is perceivable that many new candidate constructs, in addition to CD4ζCAR, will be generated and tested for stem-cell based gene therapy of HIV diseases and other diseases. In addition, the humanized NSG-BLT mouse model containing these antigen-specific CARs can also provide a useful tool to closely examine human T cell responses in vivo. Importantly, our protocol differs from previous described methods for construction of humanized of BLT mice13-15 in that the HSCs in gelatinous protein mixture is used in place of fetal liver trunks16. This protocol describes: 1) construction of humanized BLT mice engineered with CD4ζCAR; and 2) characterization of the differentiation of the genetically modified cells; and 3) characterization of the functionality of the genetically modified cells. Ethic Statement: Human fetal tissue was obtained from Advanced Biosciences Resources or from Novogenix and was obtained without identifying information and did not require IRB approval for its use. Animal research described in this manuscript was performed under the written approval of the University of California, Los Angeles, and (UCLA) Animal Research Committee (ARC) in accordance to all federal, state, and local guidelines. Specifically, these studies were carried out under strict accordance to the guidelines in The Guide for the Care and Use of Laboratory Animals of the National Research Council and the accreditation and guidelines of the Association for the Assessment and Accreditation of Laboratory Animal Care (AALAC) International under UCLA ARC Protocol Number 2010-038-02B. All surgeries were performed under ketamine/xylazine and isoflurane anesthesia and all efforts were made to minimize animal pain and discomfort. Gently wash the thymus in Phosphate-buffered saline (PBS), pH 7.4, in a 15 ml conical tube. Repeat wash step 3 - 4 times. Add 7 ml RPMI media + 10% FBS + Pen/strep. Decant everything into a sterile 100 mm Petri dish. Use scalpels to cut the thymus into small pieces of about 1 mm2. Place every single thymus piece in a single well on a 96-well plate. Use curved blunt forceps when transferring thymus pieces to the 96-well plate. Add a small amount of media (100 - 200 μl) to all of the wells so that the tissue does not dry. Visualize under microscope (thymi have lobes and should look like sacks of cells). NOTE: Discard any pieces that look questionable in any way; there is often connective tissue and this should not be implanted. Remove the confirmed-thymus pieces and place all of them into a T25 cell culture flask. Add 7 ml RPMI media supplemented with 10% FBS and 450 μg/ml of piperacillin/tazobactam and amphotericin B. Gently rock flask to mix. Culture the flask overnight at 37 ºC/5% CO2. NOTE: This step is required to prevent bacterial contamination of the tissue. (Optional step) Freeze the thymus for future use. Equilibrate the chunks in 90% Human AB Serum with 10% Dimethyl sulfoxide (DMSO) for 10 min. Freeze them at a rate of 1 ºC/min to -50 ºC, then rapid cooling to -150 ºC. When ready to thaw, rapidly thaw in a 37 ºC water bath and gently wash 3x in RPMI complete media without DMSO. Gently wash the liver in PBS in a 50 ml conical tube. Repeat wash step 3 - 4 times. Add 10 ml (Iscove's Modified Dulbecco's Media) IMDM media to the 50 ml conical tube. Decant everything into a 100 mm sterile Petri dish. Homogenize the liver tissue using two scalpels. Cut the liver into small pieces of about 3 mm2. Cut out and discard any white connective tissue. Use 10 ml syringe fitted with a 16 gauge blunt needle to take up the liver pieces and media. Then transfer to a 50 ml conical tube. Gently resuspend the media and tissue suspension and expel 5-7 more times to homogenize the tissue completely. Prepare 10 ml IMDM media supplemented with enzymes: 500 U/ml collagenase, 2,400 U/ml hyluronidase, and 300 U/ml DNase as well as 450 μg/ml piperacillin/tazobactam and amphotericin B. Filter the media via a 0.22 µm filter then add the media to the liver suspension. Cap the 50 ml conical tube containing the liver suspension and seal tightly with self-sealing film such as Parafilm to prevent leaks. Rotate in a tube rotator in the incubator at 37 ºC for 90 min. Filter the digested cell suspension through a 100 µm cell strainer into a fresh 50 ml tube. NOTE: Add PBS to the suspension to bring the total volume up to 50 ml. Split this into two tubes of 50 ml tubes each containing 25 ml of cell suspension. Slowly and gently underlay the cells in each tube with 10 ml density centrifugation media (e.g., Ficoll). Spin at 1,200 x g for 20 min without brake. Note: all centrifugation mentioned in this protocol is done at room temperature (25 ºC). Carefully remove the interface (i.e., buffy coat) from each tube and transfer to two separate 50 ml tubes. Bring the volume of each tube of interface up to 50 ml with PBS. Spin at 300 x g for 7 - 10 min. Aspirate supernatant carefully. Combine the two pellets. Wash three more times with 50 ml PBS containing 2% FBS. Spin at 300 x g for 7 - 10 min each time while carefully aspirating the supernatant. Resuspend the pellet in 50 ml RPMI media + 10% FBS. Count cells using hemocytometer at this time before proceeding to cell sorting. Sort CD34+ cells immediately using CD34 sorting Kit (e.g., CD34 micro-beads), according to the manufacturer's protocol. NOTE: Alternatively, cells can be cultured in RPMI media + 10% FBS at 1 million/ml overnight. Save both CD34+ and CD34- fraction. NOTE: At this step, CD34+ and CD34- cells can be frozen using Bambanker freezing media or other freezing medias. Freeze 1 ml of 4 - 6 x 106 CD34+ cells per tube and freeze 1 ml of 40 - 60 x 106 CD34- cells per tube. Calculate the number of transduction wells required of a 6 well-tissue-culture plate. 1 well can be used to transduce up to 8 x 106 cells. For each BLT mouse, 0.5 x 106 CD34+ will be implanted along with CD34- cells and thymus underneath kidney capsule and 0.5 x 106 CD34+ cells will be injected intravenously. The number of CD34+ cells to use is determined by the number of mice (1 million cells per mouse). Coat the needed number of wells of a non-tissue culture treated 6-well plate with 1.25 ml of recombinant human fibronectin solution (e.g., Retronectin) (20 µg/ml in PBS) into each well. Cover the plate and allow it to stand for 2 hr at room temperature in a clean biosafety cabinet. Aspirate fibronectin solution from wells and add 1.25 ml of FACS buffer (PBS with 4% FBS) to each well for blocking. Allow the plate to stand at room temperature (25 ºC) for 30 min. Aspirate FACS Buffer and wash wells once with PBS. Keep PBS in the coated wells until the plate is ready for use. Store the plate at 4 ºC overnight if not used immediately. Plate CD34+ cells in Infection Medium (2% Human Serum Albumin in Yssel’s Serum-Free T-Cell Medium) in fibronectin solution-coated wells (~2 x 106 cells/ml) and incubate at 37 ºC for 1 hr. Use a pipette to add lentiviral vector to the wells at a multiplicity of infection (MOI) between 2 - 10. Gently mix and incubate overnight at 37 ºC. NOTE: The titer of the lentivirus vector used should be determined beforehand. Harvest the cells the next morning by gently scraping the bottoms of the wells with a cell scraper. Collect cells and count with hemocytometer at this time. To prepare cells for implant, combine 0.5 x 106 transduced CD34+ cells with 4.5 x 106 CD34- cells per mouse, aliquot into sterile 1.5 ml screw-cap tubes. Spin the cells down at 300 x g to pellet them, aspirate supernatant. Spin them again at 300 x g and aspirate any remaining supernatant using a P10 pipette and aspirating very carefully. Keep the dry pellets on ice throughout the study. Note: To make sure the cells are viable, use the pelleted cells and perform the surgery within 2-3 hr. To prepare cells for injection, spin 0.5 x 106 transduced CD34+ cells per mouse to pellet them, aspirate supernatant. Resuspend cells in 100 µl RPMI media per mouse and keep on ice. To check transduction efficiency, aliquot ~1 x 105 non-transduced and transduced CD34+ cells from each condition and culture in 200 µl cytokine medium (RPMI media with 10% FBS, supplemented with 100 ng/ml human IL-3, IL-6, SCF) in 96-well plate for 5 - 7 days at 37 ºC. NOTE: Cells used in this step is not used for surgery but to ensure that transduction is successful and the vector is not toxic for stem cell survival and renewal. Transduction efficiency can be checked by looking for gene expression of the vector (e.g., GFP&CD4) and analyze by flow cytometry. On the same day prior to surgery perform total body irradiation of the NOD.Cg-Prkdcscid Il2rgtm1Wjl/SzJ (NSG) immuno-compromised mice with a Cesium-137 Irradiator and a dosage of 2.7 Gy (270Rad). NOTE: The NSG mice are severely immunocompromised. Therefore their housing and maintenance must conform to the highest health standard and handled by highly trained staff. Pour thymus pieces and medium from the flask into a 60 mm dish. Pour PBS into another 60 mm dish, which will be used to clean the trochar and keep the kidney wet. Chill positive displacement pipette tips by placing them in open 1.5 ml sterile screw-cap tubes on ice. Keep on ice with the dried cell pellets and gelatinous protein mixture such as Matrigel. NOTE: It is important to keep the gelatinous protein mixture and any tubes or tips that will touch it cold at all times until the implant needle is loaded. Anesthetize the mice: Weigh mice individually and record weights; ear punch the mice to number them. Inject them intraperitoneally with 15 µl of Ketamine (2.6 mg/ml in saline)/Xylazine (100 mg/ml in saline) per gram of body weight). Put the mice back in the cage and wait for it to be fully anesthetized. NOTE: Check the anesthesia level of the mouse by squeezing a paw. If the mouse reflexively flinches, administer 25-50% of the original amount of Ketamine/Xylazine to anesthetize the mouse further. Wait until it does not reflexively flinch to perform the surgery. Using the Oster clipper (shaver), shave the left side of each mouse from hip to shoulder between the center of the back and the stomach. Subcutaneously inject 0.3 ml of the diluted Carprofen (6 mg/kg) into the animal’s shoulder or inguinal triangle (leg pit). Using a cotton swab, put a small drop of Artificial Tears onto each eye and lay the mouse on its side back in the cage. NOTE: Limit surgery prep to one cage (approximately 4 - 5 mice) at a time. Flush the cannula of the 16 gauge cancer implant needle (trocar) with PBS. Using a pair of blunt curved forceps, place a piece of thymus from the 60 mm dish into the opening of the cannula with the trocar just inside the opening, then pull back on the trocar to aspirate the tissue into the cannula. Use a positive displacement pipette and a chilled tip to put 5 µl of cold gelatinous protein mixture into the tube with a dried cell pellet (CD34+ and CD34- mixture for implanted cells) and gently stir to generate cell suspension. Do not pipette up and down. Pipette the gelatinous protein mixture /cell suspension into the opening of the cannula and slowly pull back on the trocar to load the needle. NOTE: It is recommended to have a helper to load the pipette while one manipulates the implant needle. Swab the shaved area of the mouse with Povidone-iodine and subsequently wipe down the area with an alcohol wipe three times. Determine the darkest spot under the skin. This indicates the location of the spleen. The kidney is approximately 5 mm dorsal to the spleen. Lift up the skin with curved forceps and make a 15 mm long incision with surgical scissors in the skin parallel to the spleen. Then make a similar cut in the peritoneum layer below. In males, the kidney should be easily visible, and can be extruded simply by pressing on the abdomen. You can support the kidney with a hemostat or a pair of curved blunt forceps. In females, the ovaries tend to block the kidney from easy extraction. Using a hemostat, pick up the ovary and carefully expose out the kidney. Use the needle-tipped forceps to pluck a tiny hole at the posterior end of the kidney capsule. NOTE: Do not use these needle-tipped forceps to handle biohazard materials. Slide the implant needle into this hole and along the kidney until the opening of the cannula is completely covered by the kidney capsule. Gently extrude the tissue under the kidney capsule, and pull the needle back out. The thymus pieces can be sticky so use a curved forceps to make sure the thymus piece does not come out with the needle. Lift up the peritoneum with the forceps and gently use the hemostat to push the kidney back into place. Tie one double-knotted stitch in the peritoneum using 4-0 vicryl absorbable sutures. Use two Autoclips wound clips to close the skin. Mix the transduced CD34+ cells that were set aside for injection and uptake 100 µl (0.5x106 cells) into an insulin syringe. Inject these cells into the mouse through retroorbital vein injection or other routes of intravenous injection. Using a cotton swab, put a small drop of Artificial Tears onto each eye and lay the mouse on its side back in a cage. Once all the mice have been implanted, confirm that the animals are regaining consciousness and ambulating normally before leaving them. Post-operational care: The day after the surgery, subcutaneously inject 0.3 ml of diluted Carprofen (6 mg/kg) and 1.2 ml of sterile saline into each mouse. 2 and 3 days post surgery, subcutaneously inject 1.5 ml of sterile saline into each mouse. Monitor the mice and the incisions for 10-14 days following surgery. Remove the Autoclips and weigh the mice after 10-14 days. NOTE: Mice are sluggish after radiation and injection of saline prevents the animals from becoming dehydrated. After 8 - 10 weeks, check engraftment by bleeding the mice and performing FACS analysis on the peripheral blood, staining for markers such as CD45, CD3, CD4, CD8, and any genes the vector should express. 8 - 10 weeks after transplant, obtain 50 - 100 μl of mouse blood from retro-orbital bleed. Place in microcentrifuge tubes containing 10 μl of EDTA. Centrifuge cells at 350 x g for 3 min. Collect plasma. Freeze at -80 for ELISA analysis or plasma viral load assay if the mouse is HIV infected. Add 2 ml NH4Cl (83%) solution to lyse red blood cells. Incubate for 5 minutes at room temperature (25 ºC). Following incubation, add 10 ml RPMI 10% FBS to fill tube. Spin at 300 x g for 5 min. Aspirate supernatant carefully. Cells are ready for immuno-staining and flow cytometry analysis and other assays. NOTE: Markers for various hematopoetic cell lineages, activation, and phenotypic markers for naïve or memory cells can be measured every 2 weeks before and after HIV infection by flow cytometry. Gates are created by staining cells with isotype controls. It is recommended to stain healthy human PBMCs and use that as positive control. Alternatively, mouse can be euthanized and up to 1 ml of peripheral blood can be obtained from cardiac puncture which will provide enough cells for multiple panels of flow analysis17. Euthanize mice by using overdose of isoflurane. Confirm euthanasia with secondary cervical dislocation. Spray the surface of the carcass with 70% ethanol to keep fur from sticking to tissues. Pin down the limbs on a wax dissection tray. Use surgical scissors, cut open the skin, and then cut through the peritoneal layer to expose the body cavity. Remove the spleen using forceps. Remove the thymic implant on the kidney using forceps and scissors. Put the thymic implant and spleen in labeled tubes containing 5 ml of PBS. From mid-abdomen cut and remove the skin from the distal part of the mouse covering the lower limbs. Cut off the muscles from the lower extremities using scissors and carefully dislocate the acetabulum from the hip joint. Remove the femur and tibia and place them in a tube containing 5 ml of PBS. Place a 100µm cell strainer on a 50 ml conical tube. Wet the strainer with 3 ml of RPMI media supplemented with 10% FBS and Pen/strep (RPMI complete media). Place the spleen onto the cell strainer. Using the rubber plunger of a 10 ml syringe, mash the spleen to dissociate it through the strainer into the 50 ml tube. Rinse the cell strainer with 5 ml RPMI complete media 4 to 5 times. Spin cells at 300 x g for 10 min. Aspirate supernatant and resuspend pellet in 5 ml red blood cell lysis buffer. Incubate at room temperature for 10 min. Add 20 ml RPMI complete media and spin at 300 x g for 7 min. Aspirate supernatant and resuspend pellet in 10 ml RPMI complete media and filter again through a 100 µm cell strainer. Count cells using hemocytometer. NOTE: Cells can be used for ex vivo assays, flow analysis and can be viably frozen for later use. Before cell counting, Trypan blue can be used to determine the number of viable cells. Place the thymus into 5 ml of PBS in a well of a 6 well plate. Using clean blunt forceps and scissors cut the thymus into small pieces. Place a sterilized stainless steel mesh square into the well. Using the rubber plunger of a 10 ml syringe, mash the thymus pieces on the stainless steel mesh to break apart the thymus. Resuspend cells well and strain through a 100 µm cell strainer. Spin cells at 300 x g for 10 min. Suspend cells in 10 ml RPMI complete media. If clumps are visible, pass the resuspended-cells through a cell strainer again. NOTE: Cells can be used for flow analysis and viably frozen for later use. Clean and sterilize mortar and pestle with 70% ethanol. Place the femur and tibia into mortar. Add 5 ml of cold PBS. Use pestle to crush the bones until the PBS turns light pink and cloudy. Pipette up the fluid from the mortar and filter through a 50 μM cell strainer placed on a 50 ml conical tube. Wash mortar with 5 ml PBS and repeat five times until PBS becomes clear. Spin cells down at 300 x g for 7 min. Aspirate supernatant and resuspend in 10 ml RPMI complete media. NOTE: Cells can be used for ex vivo assays, flow analysis and can be viably frozen for later use. After confirmation of the human immune system reconstitution, inject desired amount of HIV virus via retro-orbital vein injection using an insulin syringe. After HIV infection, collect 100 μl peripheral blood via retro-orbital bleeding every 2 weeks. Harvest plasma by following steps in part 2.1.1 - 2.1.2. For HIV viral load assay, extract viral RNA using RNA extraction kit according to manufacturer's instruction and measure viral load by real time RT-PCR with appropriate primer and probe sets for the HIV virus used 4,8,18,19. Resuspend cell suspension in 1 ml PBS, divide evenly into two tubes. Spin at 300 x g for 5 min. Aspirate supernatant. To measure cell associated RNA, extract RNA using RNA extraction kit according to manufacturer's instruction and perform real-time RT-PCR using appropriate primer and probe sets. To measure HIV infected cells by flow, resuspend cells in the other tube in 50 μl FACS buffer and perform surface stain with desired antibody such as anti-CD45, anti-CD4 and anti-CD3. After surface stain, fix and permeabilize cells and stain intracellularly for gag expression using anti-Gag antibody (clone KC57). Perform flow cytometry. Harvest splenocytes from mice as described in section 2.2.2. Prepare target cells. To test the functionality of CD4 chimeric antigen receptor modified T cells, use HIV infected T1 cells as target cells. Infect T1 cells with HIV 3 days prior to the cytokine assay, confirm HIV infection by staining the cells intracellularly with anti-HIV gag antibody (clone KC57). Use uninfected T1 cells as control target cells. Co-incubate splenocytes with target or control cells at 1:1 ratio overnight. For best result, carry out a titration (1:1, 1:3, 1:9) of effector (splenocytes) versus target cells (infected T1s). For example, resuspend 0.9 million splenocytes in 0.25 ml RPMI complete media, add 0.9, 0.3 or 0.1 million infected T1 or uninfected T1s resuspended in 0.25 ml RPMI complete media. The next morning, add protein transport inhibitor for 6 hours to inhibit protein transport and perform staining for extracellular markers and intracellular expression of cytokines as described previously in 8. Figure 1 shows an outline of constructing humanized BLT mice with modified stem cell. 10 weeks after the implant surgery, the mice were sacrificed to evaluate the differentiation and development of gene modified cells. As shown in Figure 2, multiple lymphoid tissues (blood, spleen, thymus and bone marrow) were harvested from a mouse that was modified with CD4ζCAR. The CD4ζCAR used in this protocol contains CD4 chimeric antigen receptor and GFP that can be detected by anti-CD4 antibody and the expression of GFP8. Cells were isolated and stained with antibody against human CD45 as well as anti-CD4 antibody and analyzed by flow cytometry. GFP and CD4 double positive cells were detected, indicating the presence of CD4CAR+ cells in multiple lymphoid tissues. 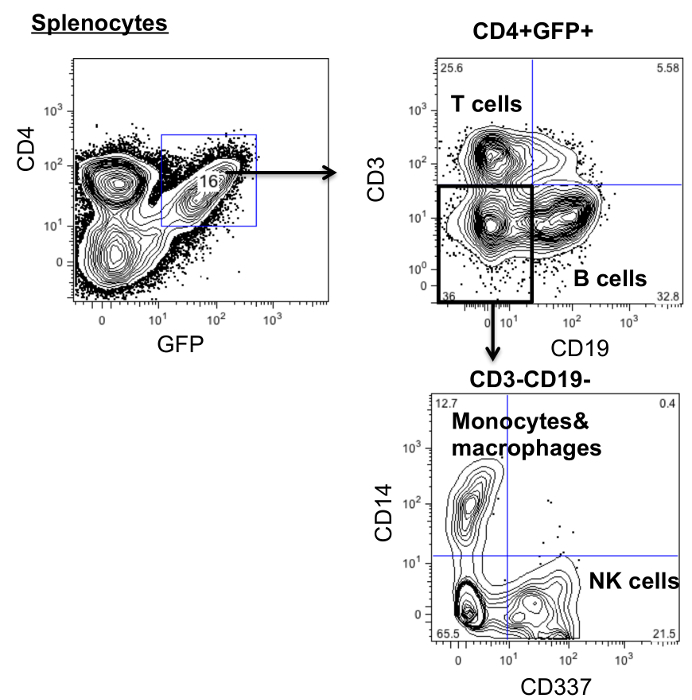 To investigate the differentiation of the gene modified cells, splenocytes were stained with antibodies against human CD45 (lymphocyte), CD3 (T cells), CD19 (B cells), CD14 (monocyte and macrophages) and CD337 (NK cells). As shown in Figure 3, CD4ζCAR hematopoietic stem cells differentiate into multiple lineages. To investigate if CD4CAR modified cells are functional, we coincubated splenocytes with target cells that CD4CAR cells would recognize (HIV infected T1 cells or uninfected T1 cells as control). Cells were co-incubated overnight and the protein transport inhibitor was added for an additional 6 hours. Afterwards, cells were fixed and permeabilized to stain for intracellular expression of cytokines such as IFNΓ and TNFα. As shown in Figure 4, CAR expressing cells produced higher amount of IFNΓ and TNFα with infected T1 cells. Figure 1: Outline of construction of humanized BLT mice with modified stem cells. FT: Fetal thymus. FL: Fetal liver. Please click here to view a larger version of this figure. Figure 2: CD4 chimeric antigen receptor modified cells can be detected in multiple lymphoid tissues. Mouse with CD4CAR modified HSCs were sacrificed 10 weeks after surgery and multiple lymphoid tissues were harvested and the cells were stained with anti-human CD45 and anti-human CD4 antibodies and analyzed by flow cytometry. Please click here to view a larger version of this figure. Figure 3: CD4 chimeric antigen receptor modified cells can differentiate into multiple lineages. 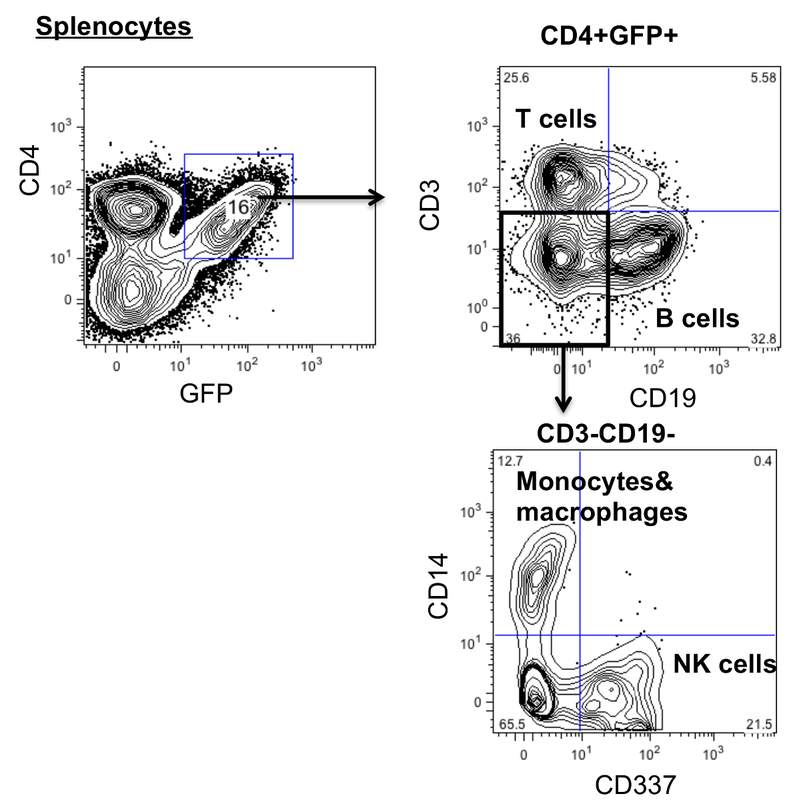 Splenocytes from CD4CAR modified mice were harvested and stained with antibodies against human CD45, CD3, CD19, CD14 and CD337 and analyzed by flow cytometry. Please click here to view a larger version of this figure. 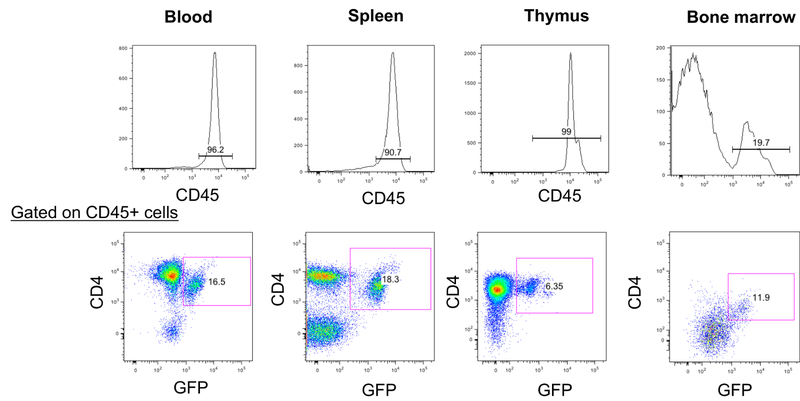 Figure 4: Ex vivo cytokine assay of CD4 CAR+ T cells. Splenocytes from HIV infected CD4CAR mice were stimulated with either HIV infected or uninfected T1 cells and their intracellular production of cytokine is shown. Please click here to view a larger version of this figure. With CAR and HSC-based engineered immunity gaining momentum towards clinical studies, it is important to have a proper animal model to closely examine the differentiation and function of these engineered cells. In this protocol we described the methods for constructing and testing humanized mice with genetically modified stem-cells engineered against HIV. It is important to have efficient transduction of stem cells prior to transplant. However, due to the ability of T cell to proliferate upon recognition of target cells, low levels of stem cell modification were sufficient to generate a robust response against HIV replication8. Nonetheless, to achieve high level of stem cell modification, we recommend using transduced CD34+ cells in gelatinous protein mixture with autologous thymus instead of liver and thymus chunks for mice surgery that had been described elsewhere13-15. Gelatinous protein mixture is a solubilized tissue basement membrane rich in extracellular matrix proteins. Under normal physiological conditions, gelatinous protein mixture polymerize to produce a reconstituted, biologically active and stable matrix that would allow effective attachment and differentiation of the stem cell20. Human cell reconstitution can be checked by retro-orbital bleeding and flow cytometry 6 - 8 weeks post-surgery. To ensure that the vector is not toxic for stem cell survival and renewal, it is recommended to titer the vector in CD34+ cells prior to the experiment as described in 1.2.6. The capacity of the NSG-BLT mouse model to support mucosal infection, consistent viremia and cellular immune responses makes it a highly useful model to study HIV immune pathology and cell-based therapies to treat HIV infection1. Most importantly, T cells generated from the NSG-BLT mice are selected in the autologous thymic tissue, allowing the researcher to study the fate of gene modified stem cells after thymic selection8,21. With the described method, we have been able to get 40%-90% human immune cell reconstitution consistently. Low levels of human cell reconstitution can result from multiple factors, including the skills of the person performing the surgery and the quality of tissues for transplant. To achieve high level of human cell reconstitution, it is important to ensure the transplants are securely placed underneath the kidney capsule. In addition, it is highly recommended to examine each thymic implant prepared for surgery under light microscope and discard any questionable pieces. Although the humanized BLT mouse model is a promising tool for studying engineered immunity against HIV (reviewed in 1,15,22), it has its own limitations. Namely, this model does not perfectly mimic a human peripheral immune system. Studies have shown impaired development of hyper-mutated, class-switched IgG antibody1,23. Additionally, using immune-deficient mice is technically challenging and keeping these mice healthy requires considerable resources and training. Subtle opportunistic infections can manifest as significant differences across samples and potentially have negative consequences on the experimentation. Therefore it is important to have well prepared facilities and appropriately trained staff to maintain integrity of the future data1,24. With these limitations in mind, the humanized NSG-BLT mouse model still provides an important tool for the study of stem cell based engineered immunity, as is demonstrated by these examples4,8. With the trend of developing chimeric antigen receptors based on HIV broad neutralizing antibodies10 and modification of the signaling domain for more efficient CAR25, this model and protocol can be used to characterize and investigate the functionality of the gene modified cells with a new generation of CARs. In addition, this model can potentially accommodate studies on immune based therapy (such as inhibitory receptor blockade) in conjunction with engineered immunity. Karpel, M. E., Boutwell, C. L., Allen, T. M. BLT humanized mice as a small animal model of HIV infection. Current opinion in virology. 13, 75-80 (2015). Zhen, A., Kitchen, S. Stem-cell-based gene therapy for HIV infection. Viruses. 6, (1), 1-12 (2014). Goulder, P. J. R., Watkins, D. I. HIV and SIV CTL escape: implications for vaccine design. Nature Reviews: Immunology. 4, (8), 630-640 (2004). Kitchen, S. G., Bennett, M., et al. Engineering Antigen-Specific T Cells from Genetically Modified Human Hematopoietic Stem Cells in Immunodeficient Mice. PloS one. 4, (12), e8208 (2009). Kitchen, S. G. S., Levin, B. R. B., et al. In vivo suppression of HIV by antigen specific T cells derived from engineered hematopoietic stem cells. PLoS Pathogens. 8, (4), e1002649 (2012). Yang, O. O., Tran, A. C., Kalams, S. A., Johnson, R. P., Roberts, M. R., Walker, B. D. Lysis of HIV-1-infected cells and inhibition of viral replication by universal receptor T cells. PNAS. 94, (21), 11478-11483 (1997). Zhen, A., Kamata, M., et al. HIV-specific Immunity Derived From Chimeric Antigen Receptor-engineered Stem Cells. Molecular Therapy. 23, (8), 1358-1367 (2015). Barrett, D. M., Singh, N., Porter, D. L., Grupp, S. A., June, C. H. Chimeric Antigen Receptor Therapy for Cancer. Annual Review of Medicine. 65, (1), 333-347 (2014). Pejchal, R., Doores, K. J., et al. A Potent and Broad Neutralizing Antibody Recognizes and Penetrates the HIV Glycan Shield. Science. 334, (6059), 1097-1103 (2011). Caskey, M., Klein, F., et al. Viraemia suppressed in HIV-1-infected humans by broadly neutralizing antibody 3BNC117. Nature. 522, (7557), 487-491 (2015). West, A. P., Scharf, L., Scheid, J. F., Klein, F., Bjorkman, P. J., Nussenzweig, M. C. Structural insights on the role of antibodies in HIV-1 vaccine and therapy. Cell. 156, (4), 633-648 (2014). Lan, P., Tonomura, N., Shimizu, A., Wang, S., Yang, Y. -G. Reconstitution of a functional human immune system in immunodeficient mice through combined human fetal thymus/liver and CD34+ cell transplantation. Blood. 108, (2), 487-492 (2006). Melkus, M. W., Estes, J. D., et al. Humanized mice mount specific adaptive and innate immune responses to EBV and TSST-1. Nature medicine. 12, (11), 1316-1322 (2006). Shultz, L. D., Brehm, M. A., Garcia-Martinez, J. V., Greiner, D. L. Humanized mice for immune system investigation: progress, promise and challenges. Nature Reviews: Immunology. 12, (11), 786-798 (2012). Vatakis, D. N., Bristol, G. C., et al. Using the BLT humanized mouse as a stem cell based gene therapy tumor model. Journal of visualized experiments : JoVE. (70), e4181 (2012). De Rosa, S. C., Brenchley, J. M., Roederer, M. Beyond six colors: a new era in flow cytometry. Nature medicine. 9, (1), 112-117 (2003). Shimizu, S., Hong, P., et al. A highly efficient short hairpin RNA potently down-regulates CCR5 expression in systemic lymphoid organs in the hu-BLT mouse model. Blood. 115, (8), 1534-1544 (2010). Denton, P. W., Olesen, R., et al. Generation of HIV latency in humanized BLT mice. Journal of virology. 86, (1), 630-634 (2012). Zhou, J., Zhang, Y., et al. Embryoid bodies formation and differentiation from mouse embryonic stem cells in collagen/Matrigel scaffolds. Journal of Genetics and Genomics. 37, (7), 451-460 (2010). Vatakis, D. N., Arumugam, B., Kim, S. G., Bristol, G., Yang, O., Zack, J. A. Introduction of Exogenous T-cell Receptors Into Human Hematopoietic Progenitors Results in Exclusion of Endogenous T-cell Receptor Expression. Molecular Therapy. 21, (5), 1055-1063 (2013). Ito, R., Takahashi, T., Katano, I., Ito, M. Current advances in humanized mouse models. Cellular & Molecular Immunology. 9, (3), 208-214 (2012). Martinez-Torres, F., Nochi, T., Wahl, A., Garcia, J. V., Denton, P. W. Hypogammaglobulinemia in BLT humanized mice--an animal model of primary antibody deficiency. PloS one. 9, (10), e108663 (2014). McCune, J. M. Development and applications of the SCID-hu mouse model. Seminars in Immunology. 8, (4), 187-196 (1996). Srivastava, S., Riddell, S. R. Engineering CAR-T Cells: Design Concepts. Trends in immunology. 36, (8), (2015).